The men’s soccer team lost at home to conference opponent Springfield College 3-1 Saturday afternoon. 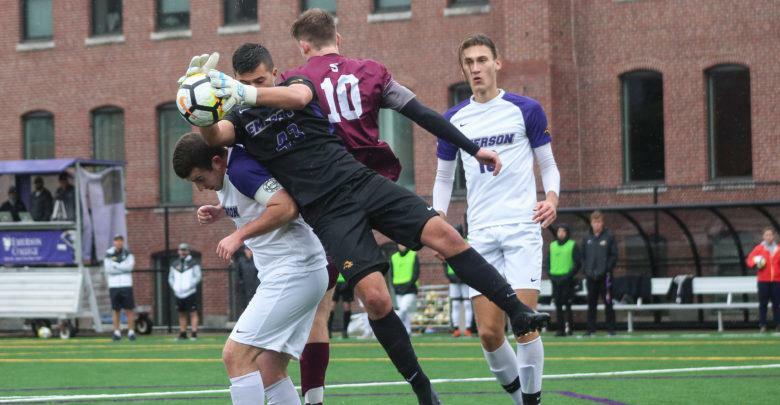 Emerson entered halftime tied 1-1 with Springfield following a goal by junior forward Gavin Faucette in the 35th minute. The Pride outscored the Lions 2-0 in the second half. Despite the loss, head coach Bryan Harkin said he liked his team’s performance. Springfield recorded 18 shots to Emerson’s six, though the Lions totaled four corner kicks to the Pride’s one. Both teams combined for 25 fouls and five yellow cards, four of which came in the second half. Harkin said Springfield’s goal at the end of the first half off a free kick from Jack Rosenberg marked a turning point in the game. Goals by Springfield’s Freddy Clark in the 58th minute and Christian Schneider in the 62nd minute pushed the Pride’s lead to 3-1 in the second half. Sophomore goalkeeper David Kemp finished the game with four saves on seven shots on goal for the Lions. Freshman defender Ryan Anderson said his team could improve its time of possession, especially in the middle of the field. The loss moves the Lions to 1-4 in the New England Women’s and Men’s Athletic Conference, and 3-9-1 overall. Harkin said that moving forward, he believes his team can build off this setback. Emerson will compete against Framingham State University on the road at 4:30 p.m. on Tuesday, Oct. 16. The Lions’ next conference matchup is against Wheaton College on Saturday, Oct. 20 at 1 p.m.